A lot of beauty products come and go… But these ones seem to be a few of the ones sticking around on my bathroom shelf. I thought I’d share them here with you as well since Stories on Instagram disappears after a while. There are certainly more favourites when it comes to make-up, but for now, these are a few that I thought were worth sharing with anyone interested in what my beauty routine might look like. I hope you enjoy! When my "Renewal Oil” by La Mer is close to be finish, I always panic just a tiny bit, haha. I use this oil on my face, before I apply my facial cream in the evening before going to bed. My skin tends to get very dry as soon as the temperatures drop and this is what saves it! I love the brand Byredo (happens to be Swedish by the way) and most of their products. But two products that I’ve definitely fallen hard for are there scented candles as well as their heavenly scented hand creams. This size of the hand cream “Gypsy Water” is perfect to take with you in your handbag! During this past summer, this “Refreshing after-sun lotion” by Nuxe is what I used on my body before going to bed as often as I could. I feel as though it’s super gentle on the skin (I had none of those little red dots on my legs after just shaving them for example) yet still very moisturising. This Gisou Honey Infused Hair Oil is a newcomer on my shelf but it’s already become a favourite. My hair cannot take a lot of oil, so I’m using this very sparingly but as explained in the description of this product, this is also something that your hair needs some time to get used to. Can’t wait to continue using it! I am so happy that I found this little magic box, also known as “Cicapair” by Dr.Jart. As you can see, I’ve use it a lot. It’s a cream that evens out your skin tone – perfect for me since I tend to have some redness in my skin. I love using this instead of foundation for make-up free days! 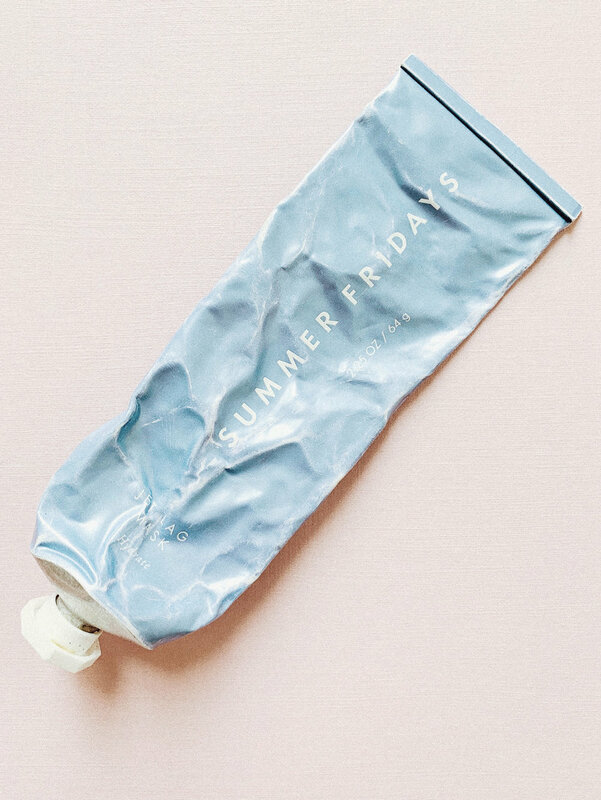 I feel as though I’ve tried a lot of face masks but this “Jet lag mask” by Summer Fridays is real value for your money. I love to leave it on overnight or at lest for 30 min before gently removing it and finding my skin super soft and hydrated underneath. I also love to just put it under my eyes! If I had the money to support this expensive habit, I would most likely never change face cream after finding this gem, also known as “The Rich Cream” by Augustinus Bader. I don’t know how, and I don’t know why, but it works miracles on my skin and I will definitely shed a tear when it’s finished. I absolutely adore the face creams and masks by Estée Lauder. For my skin they’re some of the best I’ve ever tried. I put on this serum, called “Advanced Night Repair”, before I put on my facial cream before going to bed. I love the smell, what it does, how it feels on my skin. Just everything.